In a meeting room at Randolph's Bethany Church UCC, a retired farmer and a young soil researcher discussed soil mycelium over salad and turkey cottage pie. Beside them sat a middle-aged homeowner and a thirtysomething selectboard member debating the merits of no-till gardening. In total, 43 people had gathered on the evening of March 27 to share dinner and explore a two-part question: How can we address climate change, starting with the soil? 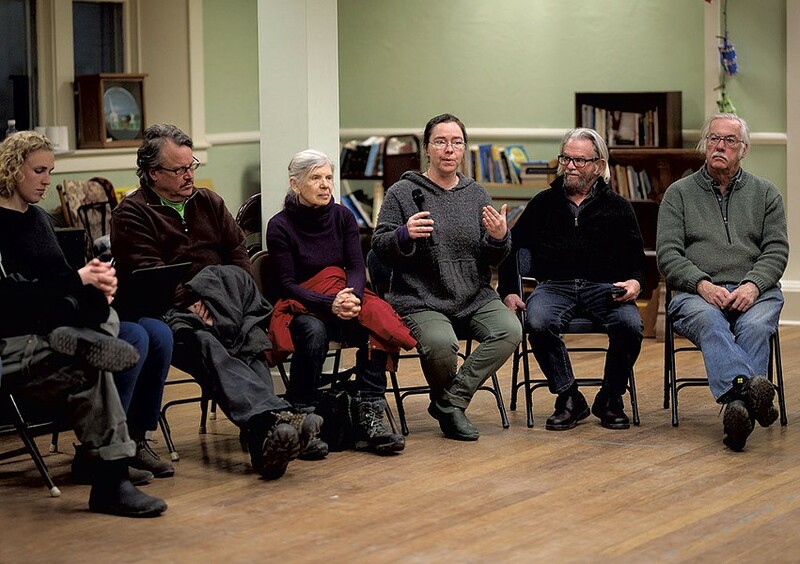 It was the fourth event of seven in "The Soil Series: Grassroots for the Climate Emergency," taking place through May 8. Presented by South Royalton group Building a Local Economy and the Vermont Healthy Soils Coalition, the series aims to educate the public on new discoveries about soil and its link to climate change, and to explain how such discoveries can inform farming and other land-management practices. The goal is to build networks of informed citizens and help them take action. "What we're finding is that people who come to these events want to help, and they feel overwhelmed," said series organizer and host Cat Buxton. "They don't know what to do." Buxton, 46, lives in Sharon and is renowned throughout Vermont as a compost consultant and soil health educator. Her series addresses the role of soil and water cycles in ecosystem function and how to adapt to a changing climate. "In our area," Buxton said, that raises the question, "How are we going to manage a lot of water, and how are we going to manage not losing all of our topsoil like we did in Tropical Storm Irene?" Soil is key to answering that question, because healthy soil absorbs and stores moisture much better than unhealthy soil. At the first five series events, 17 speakers, including Buxton, explained links between soil health and human health, how to care for soil, and what constitutes healthy soil and its function. They've also presented on community resilience efforts and the role of storytelling and language in building collaboration. When working with people who don't believe in climate change, for example, Buxton and her colleagues seek common ground. "They do believe in flooding, and they believe in drought," she noted. Nearly 50 adults have attended each series event, on average — more than half of them under age 30. "This is attracting young people, and that to me is very exciting," said Buxton. At the March 27 event, Seven Days counted 43 people from 21 Vermont towns in five counties. Randolph's Black Krim Tavern has catered each event; after dinner and speaker presentations, attendees have gathered in a circle to share reflections and ask questions. "The people who are in the room are our neighbors, and they have skills and expertise and passion, and that's all we need" to effect change, Buxton said. The next event, on April 24, will focus on how healthy soil works as a carbon sponge and how land-use practices help or harm the soil's capacity to absorb carbon. On May 8, Buxton and volunteer assistant Lauren Weston of Rochester will offer a distillation of participants' feedback and inquiries, providing a starting point to "plug people into action to address the climate emergency that we're in," Buxton said. She hopes that citizen groups will form to improve backyard gardening practices, educate legislators and work with local municipalities. She'd also like to see people join conservation boards, zoning committees and community resilience organizations. "Working with Cat is completely inspiring," wrote environmental engineer Weston, 25, by email. "She fully believes in what she teaches, and she speaks with such passion and conviction that it makes you want to change and join her efforts." "She doesn't put herself first in her work," noted Simon Dennis, chair of the Hartford Selectboard and executive director of the Center for Transformational Practice in White River Junction. "Rather, she champions the work of others, and she builds community." A speaker at the fourth Soil Series event, Dennis has enthusiastically supported Buxton's efforts. "She has ... deep chops" in gardening, permaculture and composting, he said, as well as exceptional project-coordination and grant-writing skills. Buxton has earned such accolades through more than 20 years of work in Vermont's food system, but her interest in the field began at a young age. A native of Sandy Hook, Conn., she grew up on a three-acre wooded lot in "a blue-collar family that ate really bad food," Buxton recalled. "In the '70s, it was all about convenience." Nevertheless, she said, she always felt a strong connection to nature; at age 13, she stopped eating meat "because I learned where it came from: factory farming." When she was in her early twenties, Buxton and her husband took a three-year cross-country bike trip. "We rode 9,000 miles and camped the whole way, and in doing that I learned so much about farming and food and people and America," Buxton said. After the trip, the couple settled in Sharon, and for four years she worked as grocery manager at the Upper Valley Food Co-op in White River Junction. That job and others in the food industry led Buxton to Cedar Circle Farm and Education Center in East Thetford. As its education coordinator, she developed expertise in composting, gardening and teaching, in part through creating an edible schoolyard and compost program at Thetford Elementary School. Now, Buxton works primarily as a consultant to schools, farms, municipalities and organizations and serves on multiple boards. As a Rural Vermont board member, she helped spearhead Vermont's GMO labeling law, which passed in 2016 but was soon overridden by a federal law. Buxton is also a board member of the national Soil Carbon Coalition, which teaches farmers across the country how to evaluate and improve soil health. "Looking at root depth and mass, microorganisms, worm castings, and soil aggregate is just as exciting for farmers as it is for sixth graders," she said. Seeds for the Vermont Healthy Soils Coalition were sown when Buxton attended a three-day retreat focused on soil as a carbon sponge in 2016 in Fairlee. What she learned from Australian soil microbiologist and climate scientist Walter Jehne "completely changed the way that I think about soil health and climate change," she said. Expecting to learn about helpful individual gardening practices and plant species, Buxton instead discovered that the more pressing issue was water management and that a whole-systems approach was essential to addressing it. A few months later, she launched the Healthy Soils Coalition with author and educator Didi Pershouse, farmer and radio host Henry Swayze, and Rural Vermont field organizer Graham Unangst-Rufenacht. "One of the things we're trying to do is build bridges between silos of thought," Buxton said, by connecting experts in fields such as environmental studies, farming and policy making. She wants to increase understanding of "how to leverage each other's work" and "collaborate to create ecosystem outcomes for a livable planet." According to Buxton, 300 people have joined the coalition; as of last week, 139 "experts and nonexperts" were participating in online discussions. The Soil Series garnered 24 sponsors, including Ben & Jerry's, the Vermont Land Trust, Gardener's Supply, the Northeast Organic Farming Association of Vermont, and University of Vermont Extension's Center for Sustainable Agriculture. Buxton's reputation as a smart, creative and collaborative worker is partly responsible for the outpouring of support. But advocates for organic and sustainable agriculture have stepped up because the coalition's work is essential and timely, according to Kate Duesterberg, cofounder and director of transition at Cedar Circle Farm. "Every time you plow, disc, harrow or do anything to the soil, you're losing carbon," Duesterberg said. So organic farmers, who have traditionally relied on those methods for weed suppression, "are having to retrain themselves to figure out how to grow with very minimal soil disturbance." Diverse cover crops are one answer, because they build diversity in soil microorganisms, which in turn helps to control weeds and diseases, she explained. "The first solar panels were plants," said Buxton, "and they are feeding our soil, feeding the underground zoo through living roots." Duesterberg values the coalition because it's helping "as many people as possible understand soil and what it can contribute to mitigating or reversing climate change," she said. On an individual level, people can help by growing diverse plants in their yards, gardening, composting and supporting farmers who nurture the soil. "Regenerative agriculture and healing the soil will actually reverse climate change and cool the planet," said Weston. "Stopping the use of fossil fuels won't do it on its own." Dennis doesn't foresee pushback to the soils coalition, per se, but he does anticipate "inertia and people not really paying attention." He also noted that, even in relatively progressive Hartford, some selectboard members "don't think it's the town's place to step up the global citizenship. But," he added, "it's shifting." Buxton looks to the soil for guidance. "It's a very dynamic and complex system — the selective intelligence of billions of organisms working together," she said. "I think we can learn from it." As a millennial, Weston feels the urgency. "The underlying goal of these groups is to wake people up to the land and to each other," she said. "Humans are not separate from the Earth ... There are ways to address climate change in a just and equitable manner; there is hope, and we need to act quickly." The original print version of this article was headlined "Underground Treasure | Cat Buxton and the Vermont Healthy Soils Coalition champion a climate change solution"